During the motorcade on Constitution Avenue following his White House visit the pope was reminded how urgent the need for a just resolution to our nation’s immigration crisis is to millions of American families. Seeing a five-year-old girl trying to get his attention, he waved her over. When she was lifted up to receive his kiss, Sophie Cruz handed the pontiff a letter she had written asking him to urge the President and Congress to pass immigration reform so her undocumented parents could remain in the U.S.
On Thursday morning, September 24, Pope Francis addressed a joint meeting of Congress, the first pontiff ever to do so. 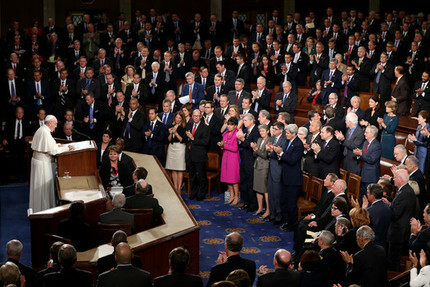 Throughout his speech he appealed to the better angles of the American character, and with his characteristic gentleness and humility, urged Congress to live up to such American ideals as equality, cooperation, compassion, and tolerance. Four Americans who embody the best of our cultural heritage and spirit were cited by the pope: Abraham Lincoln; Martin Luther King Jr.; the Catholic social justice activist Dorothy Day; and Trappist monk and mystic Thomas Merton. The pope spoke of Martin Luther King Jr.’s march from Selma to Montgomery to “fulfill his ‘dream’ of full civil and political rights for African-Americans.” He segued from the dream that Dr. King had for America — “a dream that continues to inspire us all” — to how America has been a land where immigrants have pursued their dreams for centuries. In a word count of the Pope’s address to Congress, the word “dialog” is most frequently mentioned — 12 times. Meaningful dialog requires putting aside one’s agenda and listening with openness and presence to the concerns of others. Is this Congress capable of the kind of dialog needed to address such urgent matters as immigration reform, climate change, and persistent poverty? Pope Francis, for one, believes so.